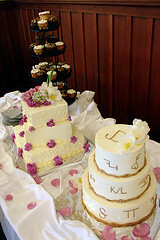 Western wedding cakes are the perfect compliment to your western or country wedding. This type of wedding is supposed to be fun, and your cake is no exception. When thinking about your cake, it is a good idea to work with a professional. Hire a good baker or cake designer to help you work out all the details to come up with a fantastic cake that matches your theme. Ask around, and go with a cake designer that is familiar with creating western wedding cakes. You will want to make sure that your cake looks professional. 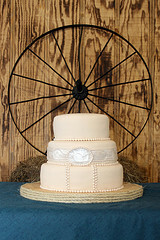 There are many great western items and designs that work really well on wedding cakes. A western belt buckle wrapped around a tier of your cake is a fun choice, or there are a number of western symbols that work great as well. Cowboy hats, boots, spurs, wagons, horses and any other western item can be worked into your design. A branding iron design with your initials can also be fun. 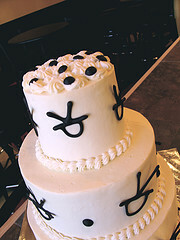 Any type of western item or symbol that your baker or cake designer can work into your cake is an option. In addition to cake designs, western cake toppers give you another chance to creatively express yourself. Adding a cake topper can be the perfect finishing touch to your cake. First, decide if you want a serious or humorous cake topper. Your chosen style should match both your personality and overall theme of your wedding. Options include poses of western wedding couples, animals, horseshoes and other country items. It is perfectly ok, however, to go with a non-western cake topper. Just make sure it fits in with the rest of your western-designed cake. Flowers can work as great accent items on your cake table. You can also use other western items like horseshoes, hay, rope and cowboy boots. Another option is to offer other desserts in addition to cake. Cookies and cupcakes in western shapes or with western designs are another fun option that your guests will love.